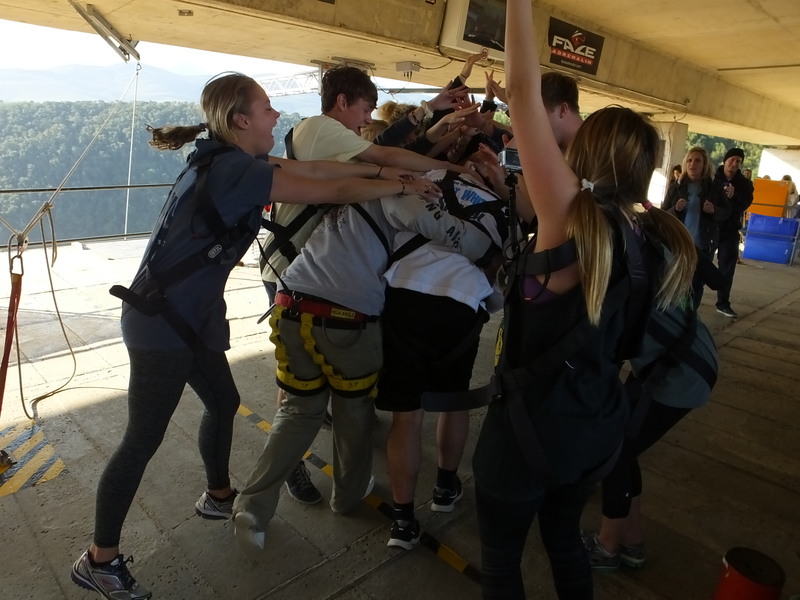 Christopher Bybee, a junior at Texas A&M University, describes a powerful moment on Bloukrans Bridge in South Africa as our students made the 709ft bungee jump. Don’t miss this incredible story of courage and support. It’s interesting in life to see simple things come together to create a powerful moment. We often aren’t able to capture the moment completely, but can later see a tangible change in our lives from our experience. During my time here in Cape Town, I’ve had the opportunity to witness a life changing moment, all thanks to a simple elastic band. As we entered the platform at Face Adrenalin Bungee Jump, my roommate Johnny Martinez was without a doubt not jumping. Now to give you some context, he is one of the more sheltered college students I have ever met in my life, with a very real fear of heights. Johnny had been pushed out of his comfort zone in a number of ways prior to bungee jumping, including eating bacon for the first time, skydiving, as well as many other small feats. According to Johnny, though, bungee jumping was not going to be one of the ways he stepped out of his comfort zone. But as people began jumping and returning alive, ecstatic, and moved by the experience, you could tell there was a little voice in Johnny’s head telling him he would regret not jumping. For the next hour, we as a group tried countless times to get Johnny to sign the waiver and commit to jumping. “Once in a lifetime,” “Regret,” “For me,” and “When in Africa” were all common phrases used to attempt to get Johnny to sign the waiver. As I had finally given up on the cause and made my way to waiting area prior to my jump, I heard screams of excitement from the other side of the bridge. Johnny had signed his life away and had hesitantly committed to jumping. Although it was a miracle in the first place to get Johnny to sign that waiver, the magical moment really didn’t begin until he stepped up on the main platform for his jump. With a face of complete fear, Johnny got strapped into his harness to make the 709 foot leap of faith. He was petrified. But with the support of the group behind him, Johnny made his way to the edge of the platform. With a slight nudge from the Face Adrenaline staff, Johnny made the leap. In that moment, I witnessed the support system that had encouraged and cheered him on reach a level of fulfillment and happiness that I had never seen before. Tears were shed and emotional embraces were commonplace. Had you seen this moment without context to the situation, I am positive it would have appeared that we had all had our wildest dreams come true. Johnny returned safely to the platform in shock, absolutely amazed at the experience. The first words out of his mouth were “I feel like my life has been changed.” There was a strong feeling of accomplishment, joy, and fulfillment radiating from the group in that moment. As I reflect back on that moment, it is crazy to think that an elastic band, a concrete bridge and some cheering people could change a life. But as I think further into that moment, I realize that it wasn’t necessarily the overcoming of fear or the action of jumping that changed anyone’s life in that moment, but rather the encouragement and love that was shared in that moment. Had it not been for the constant encouragement we gave him to challenge himself or the outpour of support as he stepped up to face his biggest fear, Johnny may not have ever jumped. It’s important to realize that encouragement and love can push others out of their comfort zone, ultimately to a positive growth. Following our week of adventure, we spent a short amount of time reflecting on the week with one of our instructors. One phrase that she said that really stuck with me is “Moving forward, find ways to be someone else’s Bungee Jump.” You don’t need a strong elastic band, a concrete bridge, or 709 feet to make an influence on someone’s life in the way that Johnny’s was impacted that day. The only thing you need is the ability to love and encourage others. This trip has been life changing for so many not necessarily because of the incredible views or the thrill of adventures, bur rather because of the love and support that can be found within this community that is missing in so many lives back home. That being said, moving forward I believe it is important to realize the power of simple love and support. Try it out, you never know what may happen. You may get someone to jump off the highest Bungee Jump Bridge in the world.